To Cite: Lasheen A E, Abd Elaziz O, Elaal S A, Alkilany M, Sieda B, et al. Surgical Wound Infections After Laparoscopic Appendectomy With or Without Using Reusable Retrieval Bag: A Retrospective Study, J Minim Invasive Surg Sci. 2016 ; 5(2):e36894. doi: 10.17795/minsurgery-36894. Background: Despite the reported advantages of laparoscopic appendectomy (LA), an ongoing debate exists about a possible increase in postoperative infectious complication rates. The analyses of risk factors associated with surgical site infections (SSIs) after LA, have been limited. Patients and Methods: One hundred twenty laparoscopic appendectomies performed over one year, were included in this retrospective study. The patients were divided into 2 group; group A was the one in which LA was done with using reusable retrieval bag and group B without using that. Demographic details, operative time, hospital stay and infective postoperative complications were recorded. Results: This patient groups were selected to be similar in both groups A and B in form of appendicitis types. Each group included 27 (45%) acute catarrhal appendicitis, 20 (33.3%) suppurative appendicitis and 13 (21.7%) perforated appendicitis, P = 1.0. The median patients ages were 21 years (range, 16 to 49) in group A and 25 years (range, 18 to 56) in group B, P = 0.053. Group A included 60 patients (35 males and 25 females) and group B 60 patients (32 males and 28 females), P = 0.071. Mean operative time in group A was 55.7 minutes and in group B was 57 minutes, P = 0.0231. Superficial wound infections were recorded in one patient (1.7%) in group A and in 8 patients (13.3%) in group B, P = 0.007. Intra-abdominal abscess formation was a complicated outcome in 2 patients (3.3%) of group B, P = 0.005. Mean hospital stay was 1.6 days in group A and 2.7 days in group B, P = 0.05. Conclusions: Surgical wound infections are less common by using reusable retrieval bag during laparoscopic appendectomy procedure. Also, using reusable retrieval bag has less cost. Surgical site infections (SSIs) are defined as infections occurring within 30 days after a surgical operation, or within one year if an implant is left in place after the procedure, and affecting either the incision or deep tissue at the operation site (1, 2). SSIs are the third most frequently reported nosocomial infections, accounting for 14% - 16% of such infections among hospitalized patients and 38% of such infections among surgical patients (3, 4). SSIs are associated with a prolonged length of hospital stay and higher costs (5, 6). Acute appendicitis is a common cause of emergency operation (7, 8). The management of many diseases is the benefit of the application of laparoscopic approach. Laparoscopic appendectomy is an increasing procedure in popularity since initially reported by Semm in 1983 (9). Several studies have shown the advantages of laparoscopic surgery in terms of shorter hospital stay, rapid postoperative recovery, and better pain control (10-13). However, there have been concerns about the risk of infectious complications, particularly the development of intra-abdominal abscess and superficial wound infection (14, 15). With occurring these complications, all laparoscopic advantages will be lost. The purpose of this study was to assess the comparative incidence of superficial wound infection and intra-abdominal abscess in patients undergoing laparoscopic appendectomy with or without using reusable retrieval bag during procedure. This study was done in the general and laparoscopic surgery department, Zagazig university hospital, Egypt, from November 2014 through September 2015. The procedure was explained to all patients, and all patients were given a written consent for inclusion of their data in this study. This study was approved by ethical committee of Zagazig university at August 2014. One hundred twenty patients were included in this research and were subjects of laparoscopic appendectomy. This patients group was divided to two groups (60 patients in each group), group A in which the reusable retrieval bag was used and group B did not use it during laparoscopic appendectomy. The both groups were selected to contain each group same percentage of appendicitis types. Acute appendicitis was suspected on the basis of clinical signs (abdominal pain and rebound tenderness in the right iliac fossa) and laboratory tests results (elevate white blood cell count and serum C-reactive protein levels). Diagnoses were confirmed by abdominal ultrasonography or a contrast enhanced abdominopelvic computed tomography scan when needed. All patients received second generation cephalosporin intravenously preoperative and for 5 days postoperative. Mini-laparoscopic appendectomy with spiral needle procedure (16) (Figure 1) was used by same surgical team in all patients of both groups. The reusable retrieval bag (17) was used during procedure in group A (Figure 2A and B) and not in group B. Irrigation and J-vacuum drain medium size insertion was performed in cases of suspected intra-peritoneal contamination. Postoperative complications were defined as any complications occurring in 30 days after the day of surgery. All patients discharged from the hospital were followed up directly by the operator teams at the outpatient department. The presence of an erythematous, painful wound with purulent drainage was considered as superficial wound infection. Intra-abdominal abscess were diagnosed with ultrasound scan, CT scan, or both of these, in patients with suspected symptoms and signs (fever, elevated white cell count, abdominal distension and ileus). The follow up period ranged from 5 to 15 months (mean was 12 months). Figure 2. A, The appendix was put inside the reusable retrieval bag, before closure its mouth and extraction from the abdominal cavity. B, The reusable retrieval bag with the appendix inside was extracted through port without contact with wound or contamination of abdominal cavity. Patient demographic and postoperative surgical outcomes among the two groups are listed in Table 1. The patients ages of group A ranged from 16 to 49 years (mean, 21 years) and in group B ranged from 18 to 56 years (mean, 25 years), P = 0.053. Group A included 60 patients (35 males and 25 females) and group B, 60 patients (32 males and 28 females), P = 0.071. Mean operative time in group A was 55.7 minutes (range, 27 to 90) and in group B 57 minutes (range, 25 to 95), P = 0.0231. The severity of appendicitis was similar in both groups (27 catarrhal appendicitis 45%, 20 suppurative appendicitis 33.3% and 13 perforated appendicitis 21.7%), P = 1.0. Mean hospital stay in group A was 1.6 days (range 1 to 3) and in group B 2.7 days (range 1 to 7), P = 0.05. J-vacuum drain was inserted in 15 patients of group A and in 17 patients in group B, and removed within 3 to 5 days after operation. Port wound infection was recorded in one patient of group A (1.7%) and 8 patients (13.3%) in group B, P = 0.007, which was managed by drainage and daily dressing as outpatient (Figure 3). Intra-abdominal abscess formation was a complicated outcome in 2 patients (3.3%) of group B, P = 0.005 and in patients who had perforated appendicitis. Management of 2 patients was achieved by insertion of pig tail catheter under CT guided for drainage. aP Value > 0.10, no evidence; P Value > 0.05 and < 0.10, weak evidence; P Value > 0.01 and < 0.05, moderate evidence; P Value < 0.01 strong evidence. Appendectomy for acute appendicitis is a common emergency surgical procedure (18, 19). Open appendectomy has been the gold standard treatment for acute appendicitis since its description by McBurney in 1894 (20). Although open appendectomy is considered a safe operation, a potential exists for complications. Most noticeable one among them are wound infection, intra-abdominal abscess, adhesions, bowel obstruction and incisional hernia (21, 22). Laparoscopic appendectomy has gained popularity with accumulating evidence demonstrating the benefits in terms of shorter hospital stay, more rapid recovery, and better postoperative pain control (23), but all of them were lost with the occurrence of postoperative surgical wound infections complications. Development of the postoperative intra-abdominal abscess after appendectomy, is a rare, but it’s a serious complication and is associated with significant morbidity (24). 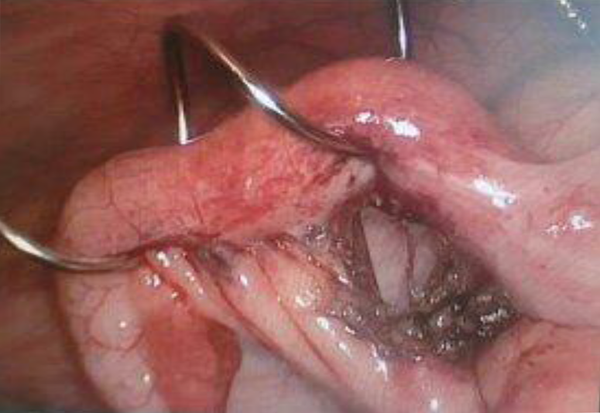 Some reports (25-27) have mentions an increased risk of an intra-abdominal abscess after laparoscopic appendectomy compared with open appendectomy, whilst others have reported the opposite (28, 29). In patients with acute appendicitis, the incidence of SSIs has been reported to be 2.8 - 12.8 % with laparoscopic appendectomy and 4.6% - 9.7 % with open appendectomy (7, 30). Although, the incidence of intra-abdominal abscess or superficial wound infection inside SSIs was not recorded. In our study, port wound infection in group A was in one patient (1.7 %) with perforated appendicitis and no intra-abdominal abscess. In group B, port wound infection was in 8 patients (13.3 %) with 7 perforated and one suppurative appendicitis, and 2 patients with intra-abdominal abscess (3.3 %) and perforated appendicitis. The two intra-abdominal abscesses were diagnosed by ultrasound scan and CT scan at day 7 and 9 after their operation, and after removal of drain by 3 and 5 days respectively which needed to drain under CT guided. In this study, the port wound infection was less in group A, because of no contact with specimen during extraction of abdomen by reusable retrieval bag. Two patients had intra-abdominal abscess in group B, also both of them suffered from extensive port wound infection and it occurred after the removal of J-vacuum drain. I think, the intra-abdominal abscess may be due to the contamination of peritoneal cavity from port wound infection or appendix contents during its extraction from port without using reusable retrieval bag. Postoperative surgical site infections with laparoscopic appendectomy are serious complications and lead to loss of all advantages of the laparoscopic surgery. The using of reusable retrieval bag, fine handling of appendix during procedure and insertion of J-vacuum drain in peritoneal cavity when peritoneal contamination was suspected, can prevent these complications. Conflicts of Interests: Authors declare no conflicts of interest.